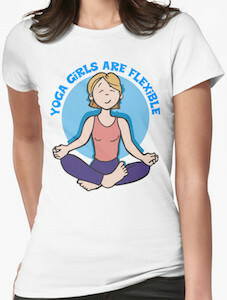 This cute yoga girls are flexible t-shirt is just something perfect shirt to wear to your next yoga class. On the t-shirt you can see a colored circle in the background and on the top of the circle it says “Yoga Girls Are Flexible” and in front of the circle, you can see a girl doing a yoga pose. 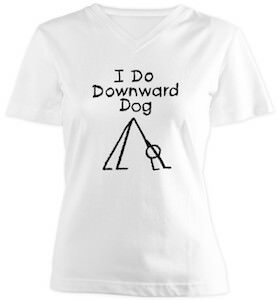 You can get this fun yoga t-shirt in women’s sizes Small – 2XL and it is available in many colors too. A shirt like this shows the world that you are flexible or want to be and you can wear this shirt any day of the week and would be just perfect for a yoga class. Did you know that Santa Claus does Hatha yoga? If you look at this t-shirt you can see Santa doing all kind of yoga poses all wearing his famous Santa suit. And below the yoga, it says “Hatha Merry Christmas”. You can get this yoga t-shirt in styles for men and women and all shirts are white and come in sizes Small – 6XL. 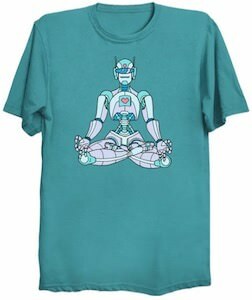 This t-shirt could be perfect for wearing to your next yoga class or as a present for your yoga instructor. 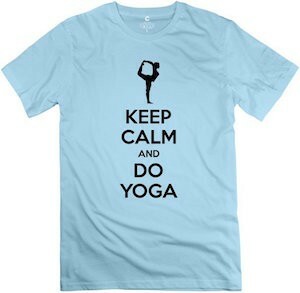 This Christmas t-shirt is perfect for the yoga class you take around the holidays. On the t-shirt, you can see a big Christmas tree but if you look closer then you notice that the tree is made up of people doing yoga poses. 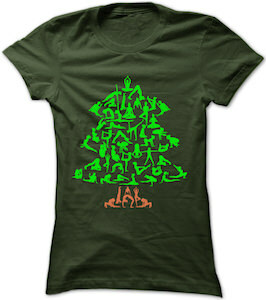 So if you are into yoga and Christmas then this is the t-shirt for you. And you can get this Christmas yoga t-shirt in men and women’s styles and it is available in many fun colors and sizes and all are made from 100% cotton. Sure when you wear this Christmas tree t-shirt people will do a double-take when they realize the tree is made up out of yoga poses. If you need yoga and coffee to get going then this is the t-shirt for you. On this women’s t-shirt you can see a silhouette of a girl doing a yoga pose and if you look closely then you can see that she is also holding a cup of coffee that is steaming hot. Besides the girl the t-shirt also says in huge letters “Yoga and Coffee”. 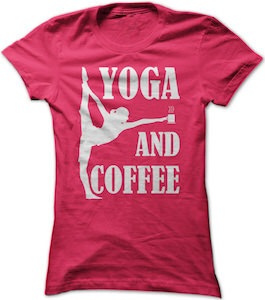 You can get this yoga and coffee t-shirt in women’s sizes Small – 3XL and it is available in many fun colors to. Made from 100% cotton this t-shirt is great for your yoga class or for your morning coffee. Ok, I am not saying that anyone is crazy. This is a t-shirt that many will get and if so then you said it yourself. Featured on the front of this t-shirt is the saying “I Do Yoga To Burn Off The Crazy” with a little silhouette of a person doing a hard yoga pose. This is a ladies fitted t-shirt that will fit snug to hug the bodies curves and allow for maximum movement, made from 100% cotton so it will be soft and feel good. It is available in a wide variety of sizes that range from Small to 3XL and choose from 8 different colors of tee’s to get this yoga print on. Have some fun with the I Do Yoga To Burn Off The Crazy T-Shirt. 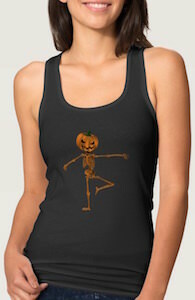 OK so you like to do Yoga why not get a fun t-shirt to do yoga in. The above design is available in all kind of styles, colors and styles but we will focus in this post on the dry wick version. The shirt above shows the word YOGA but the letters are not a normal font no they are actually people doing Yoga poses. And the shirt in the picture comes in white and pink and is made from 100% polyester and has moister wicking features so that you can work your self in a sweat and the shirt will make sure that you still feel pretty dry as it try to wick it away to the outside instead of making the shirt feel soaked making you getting a cold while working out. So if you like yoga and need a new shirt then come see this Yoga Poses Letters T-Shirt.